It’s LeBron vs. Curry (or Durant) in the NBA Finals once again and what good way to watch this exciting series than with an NBA League Pass subscription? 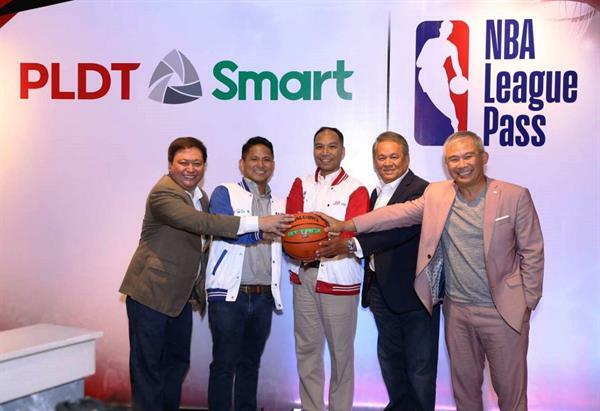 The country’s favorite basketball league, the National Basketball Association, has forged a partnership with PLDT and Smart to offer the NBA League Pass to more than 60 million subscribers all over the country. The NBA League Pass is a premium subscription-based service that gives users access to all games, live and on-demand. With an NBA League Pass subscription, anyone can watch NBA games as they happen, and they can also watch previously completed games. In the photo are (from left): Andrew L. Santos, Consumer Marketing Head for PLDT and Smart; Oscar A. Reyes, Jr., Senior Vice President and Head of Consumer Business Market Development for PLDT and Smart; Carlo Singson, Managing Director of NBA Philippines; Eric R. Alberto, Executive Vice President and Chief Revenue Officer for PLDT and Smart; and Vincent “Chot” Reyes, TV5 Network Inc. President and CEO. PLDT and Smart subscribers can avail of a Day Pass that cost P50, wherein they can watch live and on-demand games for a 24-hour period. Smart prepaid and postpaid subscribers can buy a Day Pass by texting the code NBA50 to 9999. PLDT Home subscribers can opt to add their chosen NBA League Pass offering into their monthly broadband subscription. “Filipinos have an unparalleled love for basketball, which is why the game has been at the center of our advocacy for sports excellence all over the country,” PLDT and Smart Senior Vice President and Head of Consumer Business Market Development Oscar A. Reyes, Jr. said. “Through our groundbreaking partnership with NBA, we look forward to empowering Filipinos with digital experiences that enrich their lifestyle whether at home or on-the-go – through our world-class partners and innovative platforms, powered by the country’s most extensive and robust fixed line and wireless networks,” Reyes added. This partnerships is great news for basketball fanatics across the country. Fans can choose which games they want to watch, especially when games of their favorite teams are not shown on TV. NBA League Pass subscribers have access to regular season, playoffs, NBA All-Star, and selected pre-season games live and in high-definition with live stats and multiple viewing options. Additionally, the NBA Mobile View is optimized for watching on a smaller screen like a smartphone. This allows mobile users to view players up close and personal, which is otherwise difficult with a 5-inch screen, for example. This feature is available to all NBA League Pass subscribers.